For more than 15 years, the Environmental Protection Agency has been fighting lead poisoning in North Omaha as part of a citywide environmental cleanup focused on the 27-square-miles east of 72nd Street. For a few years, my favorite place to play in my entire neighborhood was the sliver of land dirt between my family’s house and the neighbor’s house on Ellison Ave. The grass along this sliver had worn away, and I was able to dig a deep hole for my Hot Wheels cars and Star Wars figures. I spent hours and hours there whenever I could. Like almost everyone who grew up in the North Omaha community, I grew up in old houses. One of them was built in the 1920s, while the other was built in the 1890s. My family lived in a trailer in East Omaha before that, and it was built in the 1960s. A lot of the houses in North Omaha were built in that era, and the vast majority of them were built before 1978. That year, the U.S. government prohibited any use of lead in paints. Before that point, house paints were filled with lead because it helped the paint last. Looking north from approximately 8th and Dodge Streets towards the Union Pacific / Arsarco / Gould, Inc site in 1911. First, let’s clear up a few myths about the history of lead poisoning in North Omaha. Indoor paint on houses before 1950 is totally safe. ✘ FALSE: Paint makers were allowed to use lead for inside paint until 1978. House paint is the only problem. ✘ FALSE: Airborne lead pollution poisoned every generation of Omahans since 1870; house paint is the last problem the EPA is trying to solve. Its all Asarco’s fault. ✘ FALSE: There were more than 100 businesses implicated by the EPA; Asarco was the biggest polluter, but not the only one. The government doesn’t care. ✘ FALSE: I have found evidence of the City being an active partner. The Douglas County Health Department were the first “whistleblowers” in this crisis. The EPA has paid $400 million to fix up Omaha. This only affects North Omaha. ✘ FALSE: There is a 27-square-mile area affected by this crisis. This only affects African Americans. ✘ FALSE: The majority of the population within the Omaha Lead Site is white; however, African Americans are more likely to be more severely affected because of environmental racism. Everyone is clear about what’s going on. ✘ FALSE: It took me more than 40 hours of research to write this simple article. The information available is complicated, hard-to-find, and often hard to read. Public health officials have failed to communicate the bigger picture via the Internet. People who live in new houses don’t have to worry about lead poisoning. ✘ FALSE: Everyone in North Omaha should be aware that lead has covered lawns, parks, schoolyards and many other places in the community. The work is still ongoing. ✓ TRUE: The EPA’s major work is nearly finished, but the ongoing impact of lead poisoning will be felt in Omaha for at least another generation. There are still people who don’t understand what’s happened. ✓ TRUE: Because of misleading and non-comprehensive reporting, many Omaha residents don’t get this issue, even after 15+ years of work. African Americans are affected more than white people. ✓ TRUE: The ongoing environmental racism in Omaha keeps Black people from moving out of the affected areas. That’s not true for white people. Lead poisoning is a very expensive problem. ✓ TRUE: The health impacts of lead poisoning are unfortunately just the beginning. There are educational, social, economic, recreational and familial impacts that go far beyond seeing a doctor. And everyone in Omaha gets to pay for it. People in west Omaha should be concerned about this. ✓ TRUE: Everyone in Omaha is directly or indirectly affected by lead poisoning in older parts of the city. 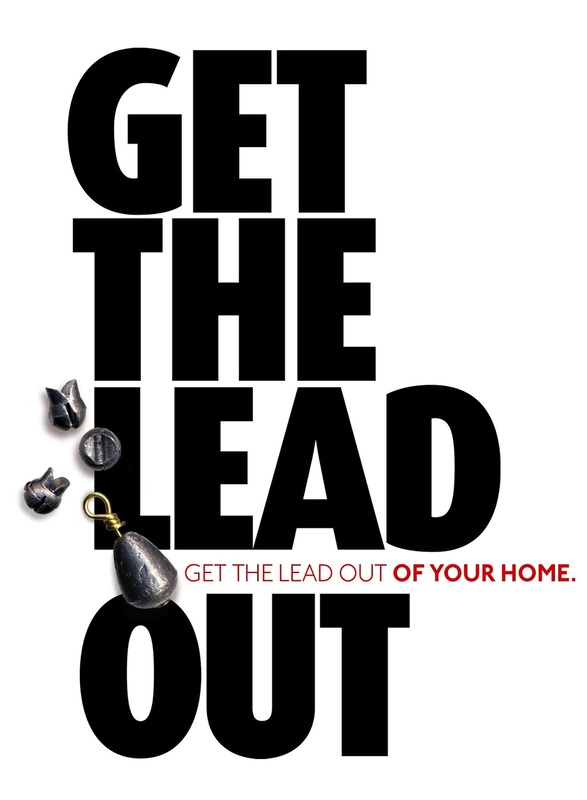 Lead is extremely dangerous to humans, and that was denied before the 1970s. Just breathing lead dust can poison humans, with all those times your mom swept or mopped around your old house actually poisoning you accidentally. This dust gets on hands and other things that babies put in their mouths, and the amount of lead in an baby’s blood is caused by the amount of lead in the house dust. Remodeling, peeling paint, and painting in an older house can all cause kids to get lead poisoning. Lead dust fills up rugs, carpets, and furniture too. House dust also contains residues of pesticides, combustion products, allergens, and other toxic substances. The soil in yards of older homes, playgrounds, drinking water, old toys and folk remedies are other places lead poisoning happens in North Omaha. Lead poisoning is tricky, too, because it can look like the flu or other sickness until it becomes very serious. In kids, led poisoning can damage the brain and nervous system; cause hyperactivity and other behavior and learning problems; slowed growth; hearing problems;headaches; irritability; fatigue; vomiting; sleep disorders; poor appetite; constipation; stomachaches; and low iron levels. Higher amounts of lead exposure can damage the kidneys, and very high exposure can lead to seizures or death. Kids are especially at risk from lead poisoning since they play in the dirt, put their hands in their mouths a lot, and do a lot of other things that leave them exposed. Chipped paint, dust particles made of paint, dirt in yards, and all kinds of exposures can leave them affected for life. Properties include single- and multi-family dwellings, apartments, child care centers, vacant lots, schools, churches, community centers, parks, greenways, and any other areas where children can come into contact from airborne lead contamination. Adults in North Omaha get hammered by lead poisoning, too. Lead poisoning in adults can cause difficulties during pregnancy; reproductive problems; high blood pressure; digestive problems; nerve disorders; memory and concentration problems; and muscle and joint pain. However, the reality of lead poisoning in North Omaha is much more terrible than living inside lead-filled houses. Looking west towards the Asarco plant in the 1930s. My mom used to get mad about the dirt we tracked in from the yard and street on our shoes. She could have been mad about the lead we were bringing in, too! The North Omaha houses we lived in are dead in the middle of a zone of poisoned land. The entirety of North Omaha consists of approximately 10,000 residential properties within an 18-square-mile area. In 1999, the City of Omaha asked the federal government for help after 600 kids across the eastern part of the city tested positive for high amounts of lead poisoning. These kids were acting wrong – less likely to graduate, showed developmental delays, their hearing was delayed and their sight recognition material was delayed. The City of Omaha freaked out. The effects of these companies and the lead at home on kids in North Omaha can’t be overemphasized. Generation after generation of children were poisoned by these companies, most of which affected North Omaha more than any other part of the city. 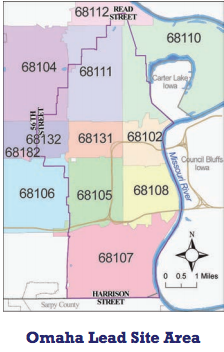 These are the zip codes in Omaha that have been most affected by lead poisoning. Several areas in North Omaha have been massively affected by lead poisoning. The people who have been affected include everyone who has lived north of Dodge and east of North 72nd Streets since 1891. That includes the zip codes of 68102, 68131, 68132, 68182, 68104, 68111, 68110, and 68112. The EPA says that188 63% of the housing in this area was built before 1950, while in all of Omaha only 27% of housing was built before 1950. Although it may be obvious, it need to be said that the longer a person lives in an affected area and the more time they live within that area, the more they are affected. That means that anyone who has ever lived in North Omaha has been exposed to unacceptable amounts of lead, and the longer a person lives in North Omaha the more likely they are to suffer from lead poisoning. Looking south towards the former Omaha and Council Bluffs Street Railway power plant after it had been converted to an ethanol plant, the former Nebraska Power Company Jones Street Power Plant, and further south, Quaker Oats’ Furfanol plant. You can just see the western end of the Union Pacific Railroad bridge on the left of the picture. The Missouri River is in the foreground. Thanks to David Budka for the details. In Omaha, where you live determines how fast you will die, and one of the primary causes is lead poisoning. Poorer neighborhoods are more likely to show how bad things are; however, race still reveals the most stark results of North Omaha lead poisoning. Racism keeps African Americans stuck in the most polluted areas of Omaha today. Statistics shows that working class and low-income African-Americans who make between $20,000 and $60,000 annually are way more likely to live in a polluted neighborhood than poor white families in Douglas County who make just $10,000 per year. As I’ve detailed before, formal redlining made it impossible for African Americans to move out of North Omaha for more than five decades, while de facto segregation continues to make it largely impossible still today. De facto segregation occurs when widespread individual preferences, sometimes backed up with private pressure, lead to separation. This is the case with North Omaha today. African Americans in Omaha are affected by generational poverty that is staggering by US standards. According to research, Omaha ranks first among U.S. cities for the total number of African Americans who qualify as low-income. This poverty disables the ability of African Americans to move out of North Omaha or to afford new housing that is contaminated with lead. The North Omaha community (east of N 72nd to the river and north of Dodge to I-680) is 55% African-American. But, before rounds of applause over that, it should be acknowledged that houses, apartments, childcare facilities, schools, and other properties where African Americans live almost exclusively throughout the community are still poisoned with lead to this day. This is environmental racism. While the EPA and the City of Omaha have worked to replace soil, plant new lawns and complete clean-up from this catastrophe, they have not finished. The neighborhoods where they aren’t done are largely Black and low-income. It is important recognize the sources of this catastrophe, so we’ll look at a history of the companies that poisoned North Omaha. The history of Omaha includes tales of roaring entrepreneurs and simple businessmen, tycoons and accidental millionaires. In their ambition, many contributed to the toxification of North Omaha by accident, while others did it intentionally. These men built the companies listed above, and a few more. The worst of them worked together to make sure one hand fed the other, and included Omaha business leaders like Levi Carter of the Omaha and Grant Smelting Company and Jay Gould of the Union Pacific Railroad. More than simply being next door neighbors on the waterfront, Gould aided the owners of the Omaha and Grant Smelting Company, and later Carter himself when he was the sole owner, by giving special rail use, cutting rates for shipping and ensuring the Union Pacific met all of the company’s needs. Similar deals were struck between and among a lot of toxic industries throughout Omaha, but especially among the ones that handled lead, and especially when they affected North Omaha. However, it wasn’t just the titans of Omaha industry who were responsible. The EPA found more than 100 potential sources of the lead poisoning in North Omaha. These companies poisoned North Omaha in a lot of ways, including air emissions from lead refining operations, dumping contaminants in the Missouri River, the old North Omaha Creek, and probably other ways, too. They included Omaha companies like Carter White Lead Company, Continental Can Company, Baton Metal Products Works, Gould National Batteries, Inc., Grant Battery Storage, Great Western Type Foundry, Lawrence Shot and Lead Company, and Omaha Shot and Lead Works. Following are highlights on how six Omaha businesses poisoned North Omaha. This is the ASARCO plant around 1900, with the Missouri River in the background. Built on the banks of the Missouri starting in 1870, the Omaha Smelting Works was the largest smelting works in the United States by 1880 and employed up to 250 men by then. The company processed raw ore into lead and precious metals. The Omaha and Grant Smelting and Refining Company was formed when Omaha merged with the Grant Smelting Company of Denver, Colorado in 1882. This is the Asarco plant as it appeared in 1997, immediately before its permanent closure. The American Smelting and Refining Company, or Asarco, bought the Omaha and Grant Smelting and Refining Company in 1889. By 1914, it was the largest lead refinery in the world. Studies by the U.S. Environmental Protection Agency (EPA) in 1972 showed the plant was releasing massive amounts of lead into the air and ground in North Omaha. More than 20 years later, in 1995, Asarco acknowledged their impact on the local residential area. Asarco told to the EPA that its downtown facility released more than 403.9 tons of toxic air emissions from 1987 to 1997. That said nothing of the previous 107 years their plant had been open. 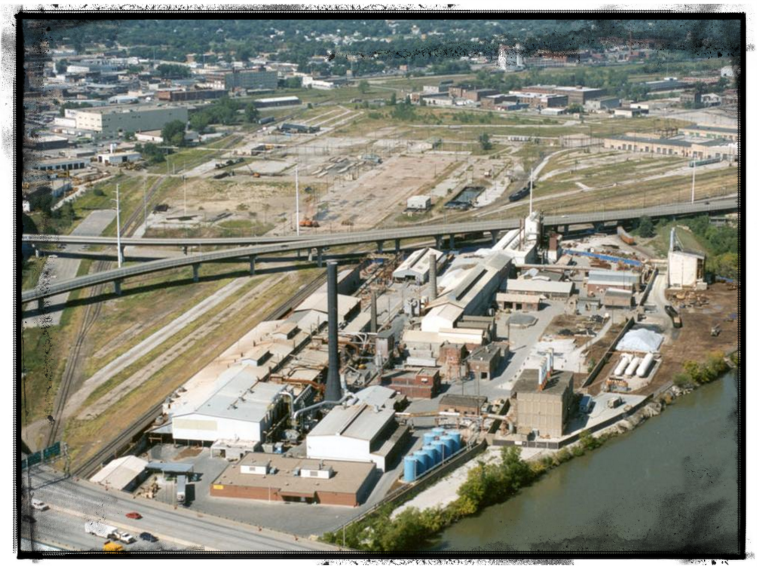 In 1997, Asarco submitted plans to the State of Nebraska to demolish and clean up their land downtown. The next year, in 1996, the EPA fined them for $3.6 million for discharging lead and other pollutants into the Missouri River. In The 1997, the plant was officially closed. In 1999, the land was turned over to the City of Omaha as 23 acre park, which the City later developed. When this pic was taken in 1969, the Omaha site was the Lead Division of Gould-National Batteries, Inc.
Gould, Inc., operated a lead battery recycling plant downtown and was considered a secondary lead smelter in the area. They used reverberatory and blast furnaces to smelt lead and lead products, and emitted lead and other metals into the atmosphere from smokestacks and other sources. The Gould plant released lead-containing particulates to the atmosphere from their smokestacks that fell on surrounding residential properties. The plant was opened in 1963 and closed in 1982. The Carter White Lead Company included plants in Chicago and Omaha. The Omaha White Lead Company was founded in 1877, manufacturing household paint to sell in the Northeastern U.S. When Levi Carter bought the plant two years later, the plant continued sending tiny lead particles all over North Omaha, eventually landing on yards and soaking into the groundwater, according to the EPA. In 1907, that company was sold National Lead, who closed it permanently in 1916. The plant was located in East Omaha between North 21st Street East and North 22nd Street East, between East Locust Street and Avenue J. The brownfield there was treated as re-habilitable, and in the 1990s, the Correctional Center was built on the site. National Lead is now called NL Industries. This is the Omaha Shot and Lead Works in the 1950s after it was bought by National Lead. 2810 A Street. This building was demolished for the construction of I-80 in the 1960s. The Lawrence Shot and Lead Company opened a lead shot tower facility South 28th and A Streets in 1897. They poured melted pig lead through a sieve at the top of a tower to form droplets of lead to be used as shot. Originally opened as the Omaha Shot and Lead Works, the company routinely released lead particles into the air until they closed in 1960. This is the logo of NL Industries, the owner of Carter White Lead and Lawerence Shot and Lead. In 1906, the National Lead Company bought all of the Carter White Lead Company stock, including its assets and liabilities. 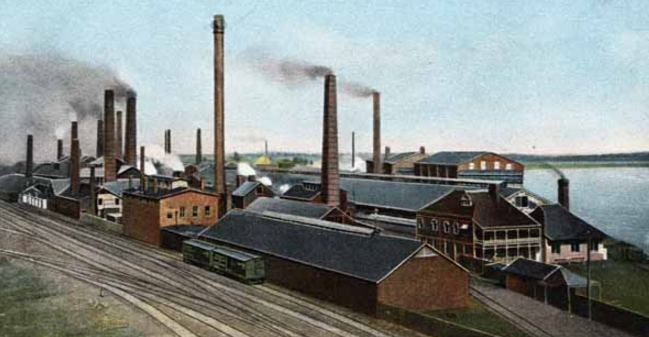 In 1909, the United Lead Company, which was a subsidiary of the National Lead Company, acquired the stock of the Lawrence Shot and Lead Company. In 1928, the United Lead Company was consolidated into its parent company, the National Lead Company. In 1971, the National Lead Company changed its name to NL Industries, Inc. Because of their ownership of these businesses, the EPA has taken NL Industries to court, suing them to prove their responsibility for causing the calamity in North Omaha. The entirety of the downtown shops for the Union Pacific and Arsarco, and eventually Gould, Inc. The Asarco facility was built on property that was leased from and owned by Union Pacific, as was the Gould facility. Union Pacific sold the land to Asarco in 1946. In the meantime, the railroad company ran lines directly into that property to deliver materials for smelting, refining and to transport out refined products. The UPRR was not proven to be guilty of poisoning North Omaha, but the implication is that their leasing of the land and transportation of the product contributed greatly to the degradation of the surrounding community. They voluntarily contributed $25,000,000 to cleanup efforts. This is the current home of the Aaron Ferer and Sons Company in East Omaha. In the last several years, the EPA has sued Aaron Ferer & Sons Company to cover their contributions in poisoning North Omaha. Founded in Omaha in the 1880s, Aaron Frerer’s company has been in the scrap metal industry and more for decades. According to their website, they are traders merchants of minor metals, non-ferrous metals, ferrous metals, chemicals, ores, concentrates, residues, and precious metals. They have two offices in China, an office in Peru, and their headquarters by Eppley Airport. In 1950, Aaron Ferer & Sons purchased 555 Farnam Street and built a secondary lead battery facility. 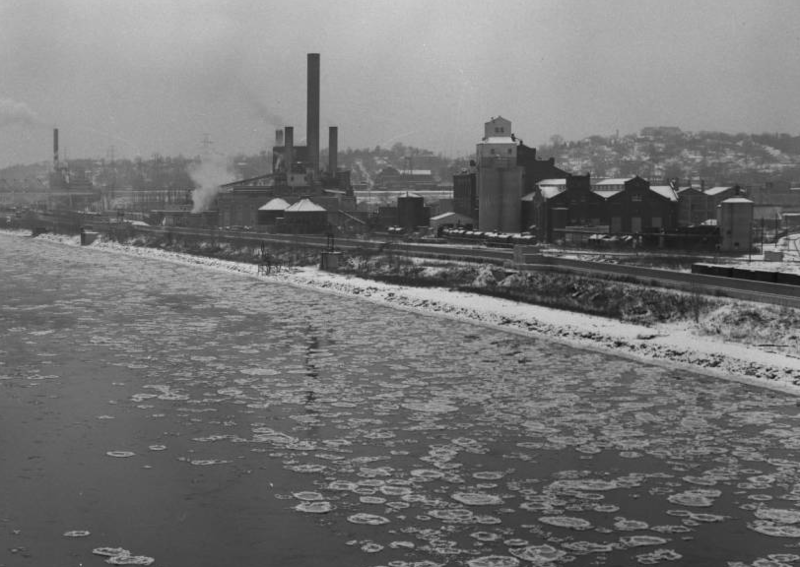 It was open from 1954 to 1963 and used furnaces that routinely released lead particulate emissions into the air, according to the EPA. 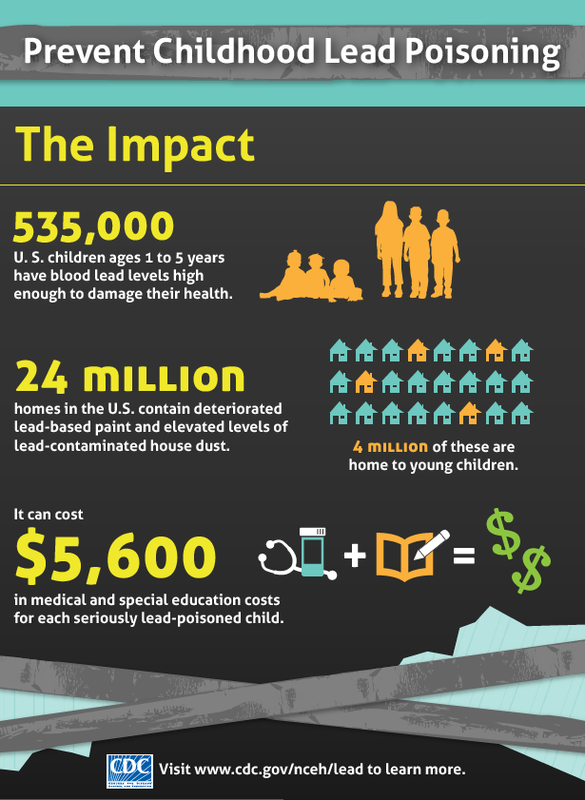 The causes of lead poisoning are well known, making lead poisoning entirely preventable. The tragedy that has fell on the shoulders of generations of North Omahans was entirely preventable. After some wheeling and dealing in the mid-1990s between the mayor of Omaha, the Union Pacific, and other corporate polluters in downtown Omaha, the City created a scheme to cleanup where the worst of the pollution was while preparing to pump downtown with a flood of new investment and space – something that rarely happens in downtowns across the country. In 1997, the City of Omaha told the EPA that too many kids had really high amounts of lead in their blood. Taking action, the EPA began a cleanup in downtown Omaha immediately. One of the first things was to acknowledge the disaster fostered in North Omaha and throughout the city by naming the area the Omaha Lead Superfund Site. Superfund is a federal law designed to clean up pollution from hazardous substances. It gives federal natural resource agencies the ability to get money from companies that make the places around them toxic. Superfund gives the EPA the ability to sue polluters, forcing them to cleanup areas or recover the costs of the EPA cleaning up the sites. 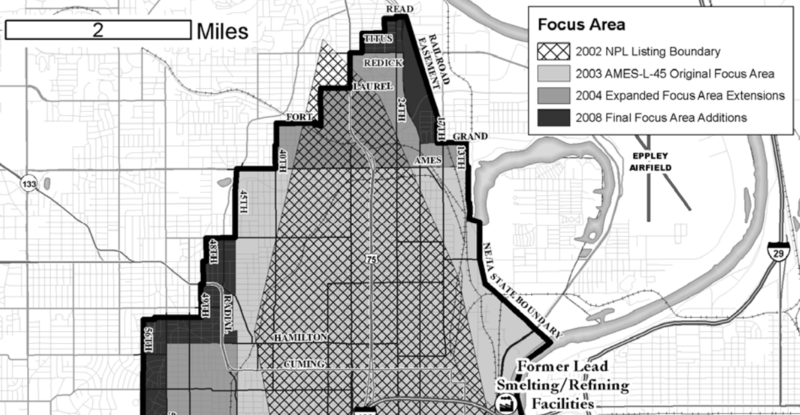 With more than 8,000 acres, all of Omaha east of 72nd Street was declared a Superfund site. An EPA spokesman reported that the Omaha Lead Site is the largest residential Superfund site in the country, and is on the National Priority List site. A site acknowledges the aerial deposits from the smelter plants, lists all the other offenders included in this article, and says there was a problem. However, they didn’t ever say these offending companies are guilty, and that’s important. The city added a second project in the revitalization effort in 2000, buying 107 acres from Union Pacific where the railroad’s shops sat near the river, after cleanup efforts directed by the EPA. The EPA immediately paid for the clean up at the Asarco and Union Pacific sites, and those were finished by 2002. There are many new features on those sites, including Lewis and Clark Landing, the CenturyLink Center Omaha, the TD Ameritrade Park, a Hilton Hotel, the Bob Kerry Pedestrian Bridge, and many parking lots. Former Omaha mayor Hal Daub takes credit for pushing Asarco from the Omaha waterfront, and HDR, an Omaha firm that contracted with , won a national award for its work to repair the land underneath the Asarco plant. According to a report, since then, through excavation, backfilling and replanting, the the EPA has cleared 10,000 properties of lead contamination, with almost half of those in North Omaha. With a total of an estimated $247 million spent on the cleanup so far, the State of Nebraska has paid approximately 10% of the costs. In 2011, the EPA, the U.S. Justice Department, and the State of Nebraska got the Union Pacific Railroad and Gould Electronics Incorporated to agree to pay $26.15 million to clean up North Omaha. However, as part of this the companies did not have to admit fault in what happened. This keeps thousands of North Omahans from suing the companies who were responsible for the North Omaha lead disaster. This is the ASARCO plant between 1910 and 1920 with the Missouri River in the background. Instead of waiting for lawsuits that take a long time, the EPA immediately started cleanup on the Omaha Lead Site. In addition to cleanup, in 2004 they established the North Omaha Public Information Center to educate residents across the community. They established a Community Advisory Group (CAG) for the site made up of residents, including several from North Omaha. Public meetings were held over the years, and a variety of activities for residents happened. This illustration shows which companies are responsible for how much damage to the Omaha Lead Site. Tracking down who is paying what for the Omaha Superfund Site was like hunting rabbits. There was a lot of motion in the early 2000s, but the dollar amounts weren’t settled. Final dollar amounts don’t match the originally ordered amounts sometimes, and the total costs keep climbing. The 2012, NL Industries settled with the EPA. Rather than paying for the EPA’s work in Omaha, the company decided to lead its own action to heal the toxic site of its former Carter White Lead Company facility, which at that point hadn’t been operated in more than a century. It was finished in six months, and the current property owners are responsible for long-term maintenance. Who Works for North Omaha? Challenges continue, and there are many organizations struggling to address them. Among the many partners working to end North Omaha’s lead poisoning crisis, groups including Omaha Healthy Kids Alliance; Lead Safe Omaha Coalition; Charles Drew Health Center, and; Sisters Together are on the case. If we acknowledge the connection between all the public health issues in North Omaha, including lead poisoning, coal poisoning, the food desert, the healthcare desert, the school-to-prison pipeline and the other catastrophe’s facing the population, it is no wonder why the vast majority of Omaha’s population isn’t interested in preserving the community’s history. As of 2013, lead levels in children under 5 have dropped from 13% of all kids to .5% now. More than $150 million has been spent cleaning up the Omaha Lead Site. An EPA spokesman said they focus on “soil, sod and seed”, and by hiring local contractors and subcontractors they have pumped a great deal of money into the local economy. Back in 1999, the federal government didn’t wait for funding to begin cleaning up this toxic waste, and instead got to work right away. Now they’re holding the polluters accountable through court action. So there is change in the air. Let’s hope the end of North Omaha’s lead poisoning nightmare is near. EPA North Omaha Public Information Center – Soil testing and soil test results in the Superfund area – (402) 991-9583. Public Health Assessment for the Omaha Lead Site prepared by the U.S. Department of Health and Human Services Agency for Toxic Substances and Disease Registry Division of Health Assessment and Consultation (ATSDR). 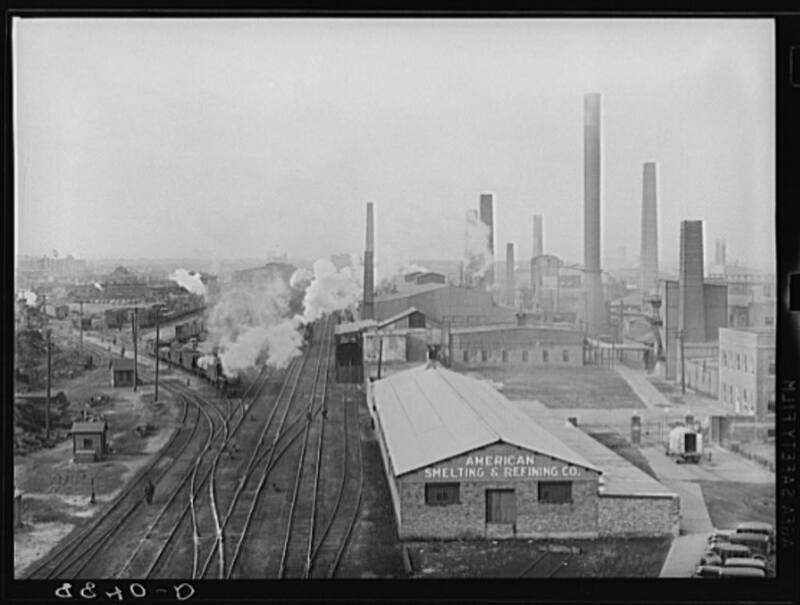 “The White lead industry in Omaha, Nebraska” by M.D. Budka for the Nebraska History Summer. A 1910s advertisement for the Gould Dreadnaught Battery. 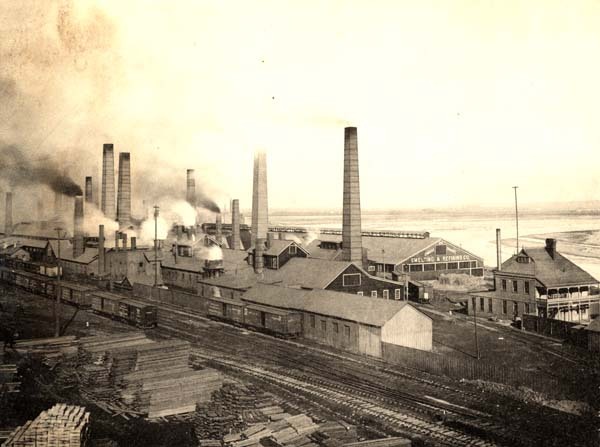 The American Smelting and Refining Company (ASARCO) plant in the 1890s. A composite 1920s pic showing the plants and railyard north of downtown. This was the source of much of North Omaha’s pollution for more than a century. These are the North Omaha places included in the Omaha Lead Site. 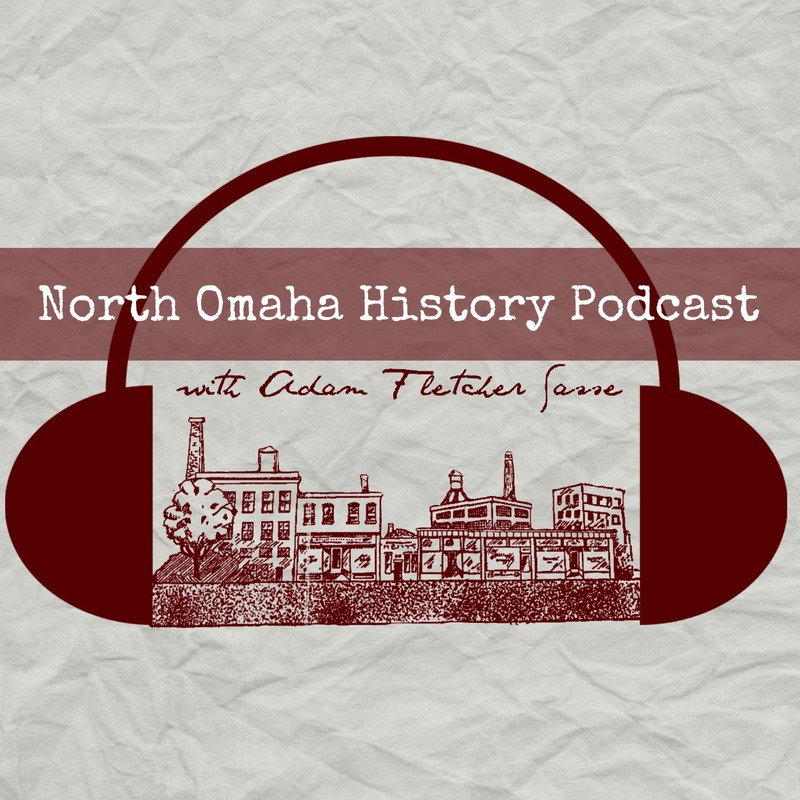 North Omaha History is written by Adam Fletcher. All content © 2006-2016. All rights reserved. I would love to see the health statistics for the now adults that grew up under the lead fall out. I remember be so sick for the stench as a little girl I couldn’t go out side. I bet a mil the long term neurological effects are staggering. The depression, cancers, muscular disorders, mental health issues, etc. are most likely kept under wraps.